Not sure on what a control does or what input it requires? This section should answer any questions you may have about a particular control or set of controls. The Log is more useful for observing what No Hands SEO is doing at any one time and there isn't really anything that needs to be done in here. The large textbox is where all information about searching, posting and link checking is posted. Take Snapshot - This will open up the built in text viewer box with all of the information that is currently in the log, this makes it easier to read what is currently in the log while it is being updated, rather than it moving around while info is being added to it. 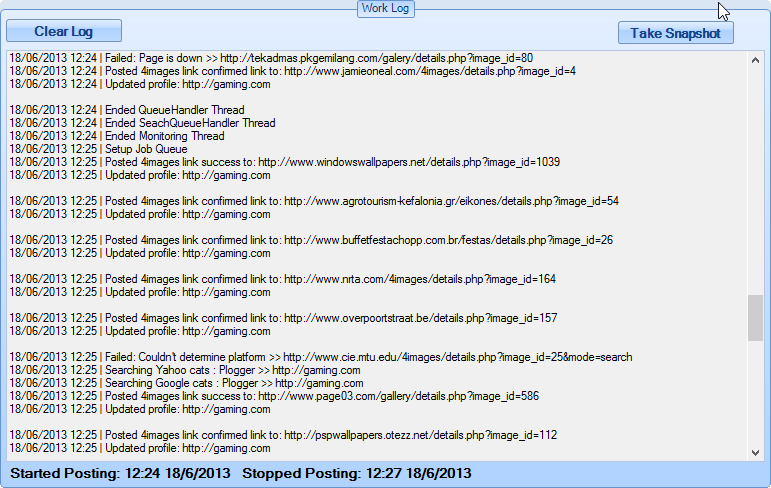 This will also output the log to a file in the "My Documents\No Hands SEO\LOG" folder for later viewing.